List Rules Vote up the most lavish – and unnecessary – royal purchases. As long as money has existed, there have been those who have more than others. Nowhere is this wealth gap more apparent than in the purchase history of the richest royal families. Throughout history, royalty has been able to get away with spending exorbitant amounts of money on practically anything they want. The question is, exactly what do the royals spend their money on? Wealthy royals live incredibly lavish lives, and some of what they buy seems – to us normal folk – unnecessarily extravagant. From gold-coated luxury cars to birthday parties literally held underwater, here are the most lavish and unnecessary things modern 20th and 21st century royals have purchased with their sovereign salaries. Collecting cars is apparently a favorite pastime of the royal and wealthy. 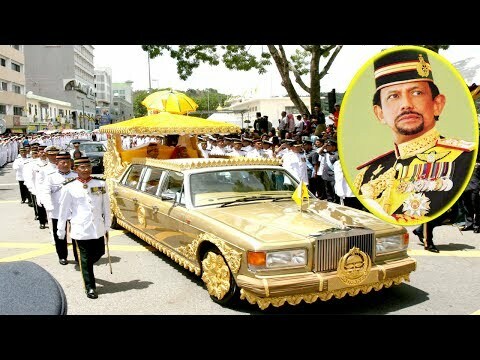 The Sultan of Brunei, who has made his family worth over $20 billion, has an extensive car collection containing the most expensive vehicles. He even has custom-made Bentleys, Bugattis, Ferraris and Rolls Royces. His Rolls Royce is even coated completely in 24k gold. Nearly half of Swaziland's population lives on a single dollar a day, but that doesn't stop the royal family from spending their money lavishly. Known for frequently flaunting their wealth on social media, the Swazi royal family has hosted birthday parties underwater, maintained extremely profligate holidays, and displayed a particular penchant for gold leaf. Their extravagant lifestyle, flagrantly boasted online, has angered the Swazi public, and an activist group called SwaziLeaks takes to social media to spread awareness about the exorbitant spending. Royal weddings are bound to be extravagant, but the 1979 wedding of Dubai ruler Sheikh Mohammed Rashid al Maktoum and Hind Bint Maktoum takes the cake. the wedding cost a whopping $137 million — more than double Prince William and Kate Middleton's. The wedding lasted a full week, and a brand new stadium capable of holding 20,000 people was built just for the lavish occasion. Five of those days were declared a public holiday, and the family chartered 34 private jets to transport their guests to the event. The world's most expensive home is a $300 million French chateau near Versailles, and it is owned by Saudi Crown Prince Mohammed bin Salman. The manor took three years to build after developers destroyed a beautiful but decaying 19th century chateau. Crown Prince Mohammed's home boasts full smart-wiring capabilities All of the lights, heat, and even fountains in Mohammed bin Salman's home can be turned on by a smart phone from anywhere in the world, and the location was even considered as a wedding venue for Kanye West and Kim Kardashian. Despite the hefty price tag, the home isn't the most expensive thing the Saudi Crown Prince has purchased. He owns a $450 million painting – controversially attributed to Leonardo da Vinci – and a nearly $500 million yacht.